You are currently browsing the tag archive for the ‘Janice McDonald’ tag. AUGUSTA — Janice McDonald tried to fight off a vicious knife attack by her youngest son before succumbing to her wounds on Aug. 24, 2009. The state says it was a depraved act of murder. The defense says it was an act of manslaughter, provoked by a lifetime of abuse. A jury will decide this week in Kennebec County Superior Court. No one says that Kenneth McDonald didn’t beat and stab his mother to death in the home they shared in Monmouth. McDonald was indicted on one count of murder, and pleaded not guilty to that charge. In court Monday, Assistant Attorney General Leane Zainea questioned neighbors and family members about the relationship between the mother and son – the central element of Kenneth McDonald’s defense. Most said that Kenneth McDonald, 44, was quiet, and that they never heard the two argue. But defense attorney James Billings said the attack came after Janice McDonald repeatedly refused to let her son take a trip to the coast. She also refused to change his doctor’s appointment and call his workplace to say he would be gone, Billings said. Kenneth McDonald worked four days every other week at the Monmouth Transfer Station. Billings said Kenneth McDonald, who was described by family members as “slow,” depended on his mother for everything, even permission to take money out of his own bank account. Billings told jurors that they should find Kenneth McDonald guilty of manslaughter, not murder. He said Janice McDonald was her son’s best friend, but she constantly told him he was incapable of doing anything on his own. Billings said Kenneth McDonald asked his mother several times for permission to take a trip, until an argument broke out early on Aug. 24, 2009. “She did not approve of the plan. She became angry. She slapped him across the face,” Billings said. “At that point, he boiled over, he snapped. Zainea told jurors that Janice McDonald, who was 80 when she died, lay defenseless – wearing only a nightgown – as the youngest of her seven children stabbed her repeatedly. “Her throat was cut so severely, it severed her jugular vein and her carotid artery,” the prosecutor said. For part of Monday, witnesses testified about Kenneth McDonald’s whereabouts and calm demeanor as he made his way from Monmouth to Lewiston and finally hitchhiked to Bailey Island in the 24 hours after his mother’s death. Wearing a light blue shirt and a light blue tie, Kenneth McDonald sat quietly through the testimony. He has been in custody since his arrest on Aug. 25, 2009. Fourteen people testified on Monday, as the state began presenting its case. Billings told jurors that they can expect to hear from Kenneth McDonald when the defense presents its case. 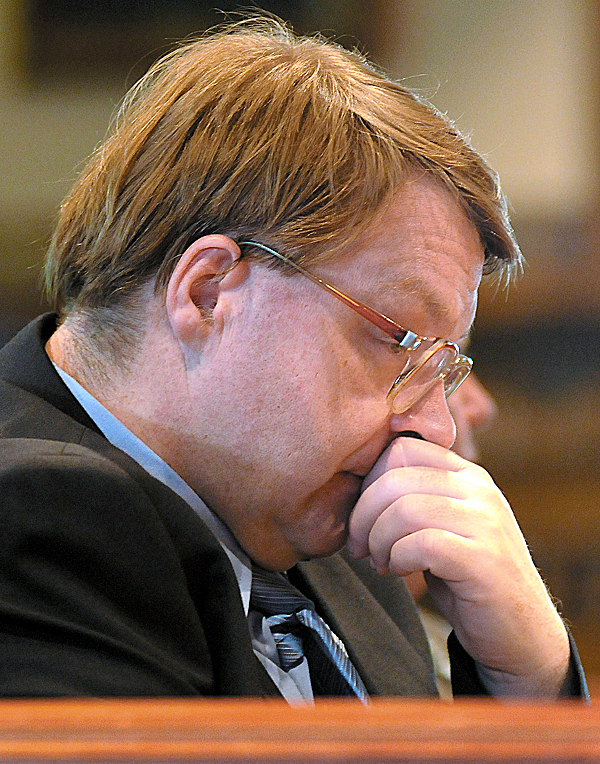 Kenneth McDonald listens to opening arguments during his murder trial Monday, Aug. 30, 2010, at Kennebec County Superior Court in Augusta, Maine. He is accused of murdering his 80-year-old mother, Janice McDonald, in August 2009. His defense attorney contends he was driven by a lifetime of abuse from her and he should be convicted of manslaughter, not murder. AUGUSTA, Maine — A Monmouth man has been sentenced to 30 years in prison for killing his mother last year in the home they shared. Forty-four-year-old Kenneth McDonald abruptly ended his trial on Sept. 1 when he pleaded guilty to murder in the stabbing death of 80-year-old Janice McDonald on Aug. 24, 2009. He was sentenced on Wednesday on Augusta. WMTW-TV reports that the judge said she considered his diminished mental capacity and believed McDonald was sorry for his actions.